OSWEGO, NY â€“ The smooth sounds of the Cortini Brothers will fill the air during the Aug. 5 Oswego Farmersâ€™ Market. Featuring Joe Cortini on drums and Kimo Cortini on keyboards and vocals, The Cortini Brothers musical talent and song selection have made them one of the areaâ€™s most popular bands. 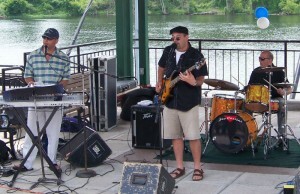 The Cortini Brothers will be providing the musical entertainment as the Oswego Farmersâ€™ Market continues Aug. 5. Located on West First Street, between Bridge and Oneida streets, the market offers a great selection of fresh produce, with new items and vendors added weekly as more produce comes into season, plus a variety of homemade baked goods and delicacies, and plenty of arts and crafts.